This recipe lets you ​enjoy crispy fried fish in a diabetes-friendly way. Breaded with whole grain cornmeal, this recipe for cod gets cooked in the oven instead of the deep fryer. Top it with a dollop of homemade avocado puree, packed with healthy fats and fiber. Heat oven to 400 degrees. Spray a large baking sheet with olive oil. Spread cornmeal on a large plate. Mix in salt and pepper. Dip fish lightly into the cornmeal. Arrange evenly on the baking sheet. Spray the top of the fish with olive oil then place in the oven to bake 20 minutes, until it’s cooked through and flakes easily with a fork. Mash avocado in a bowl. Mix in red onion, lime juice, and salt. 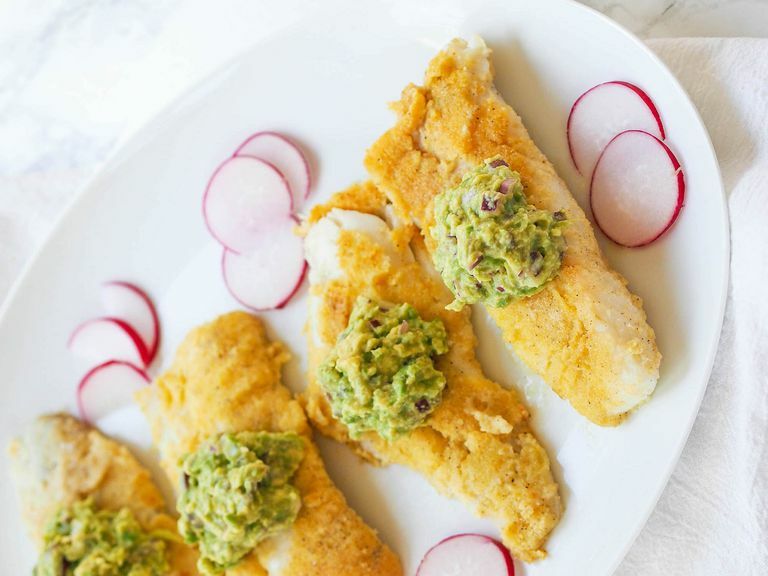 Serve fish topped with a large dollop of avocado puree. I love to use stone-ground cornmeal for oven-frying because—surprise—it’s actually a whole grain! Whole grain flours still contain the bran and germ of the intact grain, increasing the fiber, vitamin, and mineral content, making it a healthy carbohydrate choice for a diabetes-friendly diet. Plus, cornmeal adds a delicious flavor to the coating. If you can't find it at the grocery store or local farmer's market though, feel free to substitute fine polenta, masa, or regular cornmeal. You could even use almond meal if you have it on hand. If you enjoy spicy fried fish, add a teaspoon of paprika and a few dashes of cayenne to the mix. Another seasoning option is creole seasoning, which is usually made with onion powder, garlic powder, thyme, oregano, paprika, and cayenne. It may already contain salt though, so leave the additional salt out. If you’re not big on the taste of avocados, consider swapping the avocado puree for a store-bought or homemade salsa. Personally, I love fruit salsas like mango or peach salsa on fish. To save time, feel free to swap store-bought guacamole. While fresh always tastes best, pre-made is also a smart purchase, especially if you can’t find any ripe avocados at the store or your avocados tend to go bad on you before using. To check if your avocado is ripe, look to make sure it has black skin without any indentations. It should yield to firm yet gentle pressure. You can also check the color beneath the stem, which should be a pale green. If it’s a pale yellow or brown, it needs a few more days to ripen. If it’s dark brown, it’s overripe. To round out this meal, serve with a side of brown rice or another whole grain, like farro or quinoa, tossed with fresh herbs. This is also delicious with steamed or roasted sweet potatoes. I especially enjoy sweet potatoes flavored with chili powder. The sweet and spicy combination is quite appealing. To keep things simple, serve this with a side of roasted vegetables. Since most vegetables roast at 400 degrees, you can put a roasting sheet of chopped vegetables tossed with olive oil in the oven on the rack beneath the fish to cook.